SRG Graphite Inc. (SRG:TSX.V) produced its first 95% graphite samples at its metallurgical laboratory located at its Lola project in Guinea, West Africa, it announced in a news release. Following commissioning of the facility and training of the lab technicians by Quebec-based SOUTEX, the on-site team now can produce graphite concentrate samples of various flake sizes and grades. This capability allows SRG Graphite to quickly generate and send samples to prospective clients straight from the lab. “We are excited to send samples to prospective clients directly from our lab. This step for the company is in line with our values: to invest in our local team, infrastructure and training, as they are the key to our success,” commented Raphaël Beaudoin, P.Eng., VP Operations, Metallurgy and Process Design. SRG noted that it used local vendors and construction companies entirely for the building and facilities, excluding the technical equipment. This month, Energy Fuels Inc. (EFR:TSX; UUUU:NYSE.American) produced its first vanadium concentrate, or black flake, from the tailings pond solution at its White Mesa mill, it announced in a news release. “We are extremely pleased with the quality and purity of our initial batches of finished vanadium product,” which should meet or exceed the requirements of potential buyers, President and CEO Mark Chalmers said in the release. After ramping up vanadium production during Q1/19, the company aims to reach full production of 200,000225,000 pounds of vanadium by quarter’s end, provided the efforts remain economically viable. At its Nichols Ranch in situ recovery plant, the miner will “install new ion exchange capacity” and upgrade other equipment to increase flow and decrease costs, according to the release. Lastly, Energy Fuels guided to producing 50,000125,000 pounds of uranium in 2019, 50,00075,000 pounds of it from Nichols Ranch. As for vanadium, management expects to sustain steady state production of 200,000225,000 pounds per month, once reached, through the first half of 2020. Unarguably, the finest piece of work that I have ever seen on the state of the global financial worldeveris the one recently created and presented by Grant Williams of RealVisionTV entitled “Cry Wolf.” I was watching it last evening for the fifth time with my better half (who was watching it for the first time) and despite the fact that as bright and insightful as she is, I could and would not expect her to grasp concepts such as “Exter’s Inverse Pyramid” or the definition of a “trophic cascade” but when I glanced over to gauge her reaction to what might have been fairly glutinous material, to my delight she was glued to the screen as the history of her favorite form of metal unfolded in Grant’s purely brilliant display of 5,000 years of human folly, greed, and insanity. The coup de grâce was the ending of the piece where Grant draws a phenomenal analogy between the role of the Grey Wolf in controlling the uncontested overpopulation by the deer and elk of Yellowstone National Park and the role of gold in controlling the uncontested overpopulation by the “money-changers” in global economics. The term “apex predator” is wonderfully applied to gold and the Grey Wolf in that there is no natural predator to keep wolves in check just there are no counterparties to the role and control of gold. When you look at Exter’s Inverse Pyramid, you are looking at a ranking of all assets from the top to the bottom of the risk slope so it is of interest that in the upper half of risk we find none other than real estate, where the city of Vancouver recently reported a 40% drop in residential home sales for December on the heels of a 42.5% drop in November. Prices are down 810% in Vancouver and Toronto as the marginal (foreign) has finally been legislated away as depositories for expatriated Chinese capital. Even New York City has seen a 14% decline in sales with an accompanying 4% drop in prices so the world of asset inflation in the saddle of unbridled money-printing and credit creation has come to a resounding and screeching haltor has it? After Friday’s Federal Reserve Lovefest with Janet Yellen and Jerome Powell all sending out dovish signals, perhaps the December rout has altered policy. Back to the title of this missive, “Cry Wolf” offers the proposition that a return to the gold standard would create a “trophic cascade” of sorts in the financial world. That is to say, an ecological event in which there exists an “apex predator” at the top of the food chain whose re-introduction (as in the case of the Grey Wolf to Yellowstone) to an ecological system triggers a massive metamorphosis of that system. Just as Grant’s video depicts changes occurring after the return of the wolves, which include even the rivers, the re-introduction of the gold standard would initiate a change in the financial system whereby purveyors of credit and paper promises would be penalized, and savers and disciples of sound money and fiscal sanity rewarded. As a true adherent to the rights of all citizens to have their hard-earned savings protected from the ravages of currency debasement, I would welcome any initiative that would wrest the printing presses away from the bankers and the politicians. To wit, this is exactly the message in Grant William’s brilliant presentation and it behooves us all to watch over and over and over again until it sinks deep within our cranial vaults and forever alters our ingrained and flawed attitudes about investing, labor and money. Stock prices closed out the week with a solid gain, which come as no surprise to those who are privy to my Twitter feeds. 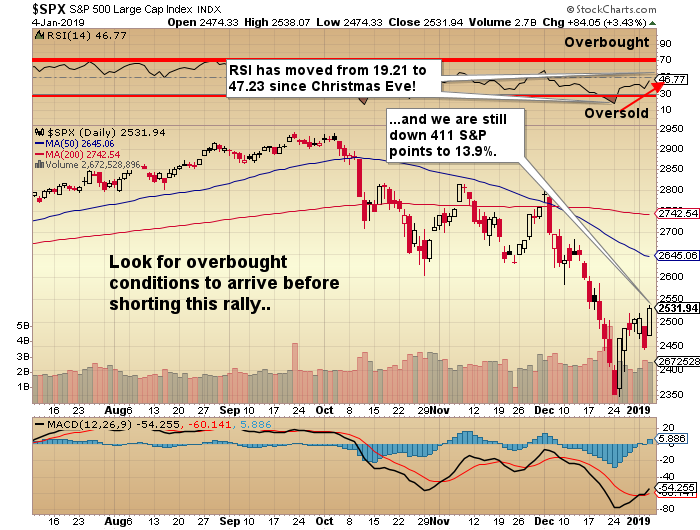 The time to be short expired once the RSI for the S&P dipped under 25 and the time to go long (for a “trade”) was on Christmas Eve when it plunged in a panic liquidation under 20. Notwithstanding that I elected to pass on the long side despite the obvious massive oversold condition that arrived late during the worst December in a decade (at one point the worst December since 1931), I went into Christmas with all (non-precious metals) shorts covered and all puts sold. Only the Santa Claus rally period, defined as the last five days of December and the first two of January, was able to save the month quarter and year for many stock bulls as it eked out a 1.3% gain for the period. Statistically, it infers that there is a distinct possibility that the Christmas Eve lows at 2,351 for the S&P were THE lows but we still need to see what happens after the Monday/Tuesday closes which, if positive, would further enhance the likelihood of a prolonged recovery rally. Without the benefit of a crystal ball, my gut tells me that we are going into a sideways-trending period for stocks as opposed to the “New Highs” halcyon of the past ten years or “New Lows” below the December 24 nadir. As a trader, I was terrified in early November when I looked at the Goldman Sachs (GS:US) chart in the days after the Indonesian scandal broke because I did NOT see opportunity; I only saw another potential loss from trying to short a big name U.S. bank. What gave me courage was the knowledge that since the Fed was no longer in “protector mode” and social media starting to viralize the GS story, it appeared as though “conditions” had changed, and when conditions change, I change. I bought the GS December $200 put at $3.40 and sold them at $25, which was actually about $15 too early as GS hit $160 by expiry. Nonetheless, I was a nervous wreck throughout. That said, I am now of the opinion that the elitists are going to attempt to restore market confidence due to their (rightly founded) fear that recent global market turmoil will see the embodiment of the negative asymmetrical wealth effect of declining assets prices. Stocks, housing and commodities are now trending downward and while stocks alone are enough to sour consumer spending patterns, housing has an infinitely greater impact, as we saw in 2006 when the sub-prime bubble triggered the beginning of that catastrophic foreclosure/liquidation cycle. As the Q4 earnings reports start to arrive, we may see accelerated interventions and abbreviated declines as they try to “soft-land” the stock markets. The first five days of January can give you an inkling as to the month of January just as the Santa Claus rally might be giving us a similar bullish hint. The time to be short has passed us by and while it might be too early to go long the S&P, I await an RSI north of 70 (currently 46.77) for the S&P 500 before I look to establish any shorts and I would avoid any new longs until I see a successful retest of the December lows OR an RSI back under 25. As for the VIX, it has already crashed from 36 to 21 and if there is ANY ONE indicator that smells of intervention, it is the VIX. 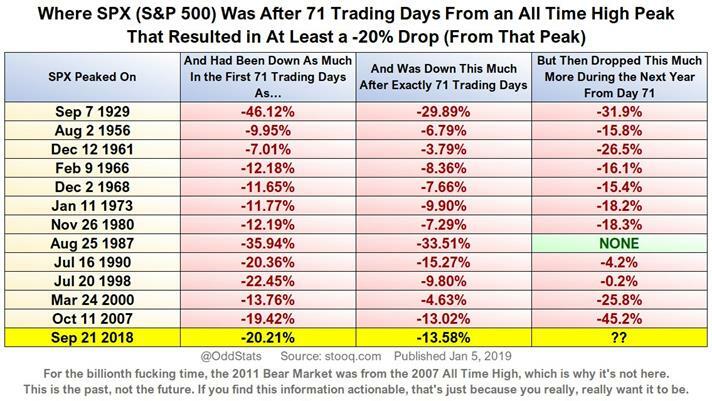 Last point on stocks, what spooked me out of all shorts in the days before Christmas was none other than Stevie Mnuchin (U.S. Treasury Secretary) who came out and actually ANNOUNCED that he had called a meeting of the Working Group on Capital Markets and while it “appeared” to have blown up on Christmas Eve, I have ZERO doubt that the Plunge Protection Team were mobilized in force from Boxing Day onward. The action in the gold and silver markets and the massive move in S&P futures immediately following Friday’s NFP report were the “tell” along with my curiosity as to why there is no government-generated COT report while the U.S. government is “closed,” but there was a magical arrival of the NFP report from yet another government agency that was somehow supposed to be “closed.” I do NOT want to be short with shenanigans like this showing up on our doorstep once again. Ergo, I am not. 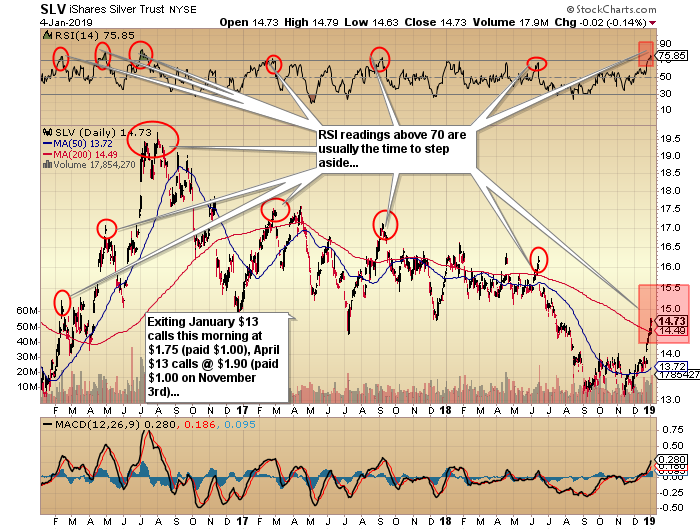 As to the precious metals and in keeping with my current mistrust of the set-ups from last week, I looked to the RSI on silver as a signal to exit my call option positions, which treated me nicely over the time frame. I did not sell any physical silver nor did I cash the ticket on CDE; all I did was take a little risk off the table last Thursday prior to the NFP Report. While we got a downtick in gold and silver immediately thereafter, they recovered quickly telling me that there is a pretty strong undercurrent of demand for gold and silver here and that pullbacks may be short-lived. I called for a strong Q4 back in August when I wrote “Back up the Truck” and while past luck is no guarantee of future bragging rights, I nevertheless am proud to take the bow just as I did in late 2015 when I called the end of the precious metals bear markets at gold $1,045. We are undoubtedly entering a period in our lives when “preservation of capital” (AND PROPERTY) is going to replace “return on investment” as the primary objective for a new generation of investors too young to recall a bear market that was ever allowed to go to full maturity without a Fed bailout. Only after they come to the sudden realization that crying into their social media camera phone will not turn back the clock on a margin call will they accept the fact that stocks can and do indeed go down over long periods of time and historically never, EVER get rescued by anyone other than the free market capitalist buying at the lows at the end of the bear market. 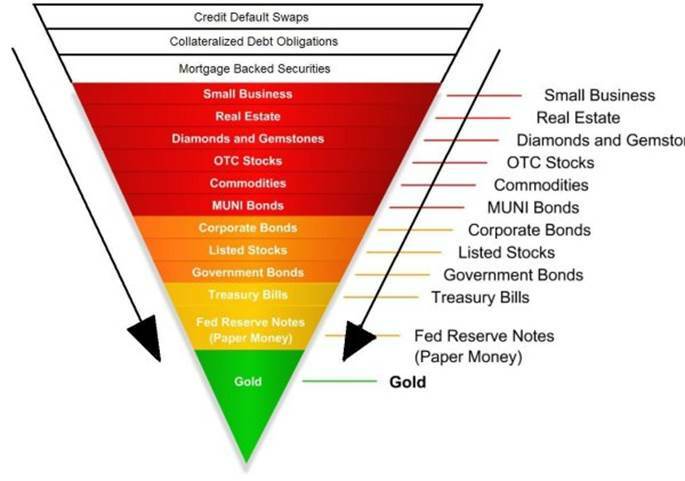 Of course, this is where the new generation will flock into the metals because they now recognize that the digital safe haven that they THOUGHT would replace gold and silver as their private, innovative, untouchable store of valuecryptocurrenciesgot absolutely annihilated in 2018. They are slowly realizing that as possession is nine-tenths of the law, allowing a massive supercomputer to control your net worth and savings is nothing short of madness. Yet, despite all of this, social media is still rife with all manner of crypto promotions with bagholding converts all citing various “support levels” from which the next big move to Bitcoin $100,000 will occur. Just as latecomers to the massive 20012011 precious metals moonrocket were mimicking “$5,000 gold!” for months and months and months after they paid $1,800 then $1,700 then $1,500 after the 2011 peak and were soundly thrashed, so, too, will the crypto-junkies be thrashed and forced kicking and screaming into precious metals ownership. Right behind them will be the weed-o-philes and behind them the FANG-buying stockroaches complete with their “DOW 30,000!” baseball caps and CNBC tee-shirts. Gold prices have had a blistering move since my entry point in late August, albeit we had a few scares along the way before lift-off finally came through. Nevertheless, a $110 move in gold is not to be sneezed at with the GLD April $13 calls recommended in November at $1.00 and then followed up a week later with a strong, table-pounding, screaming “BUY MORE!” when GLD briefly sank back under $114.00. The April calls closed out the week at $1.90 and I have not, as yet, sold them but will be watching eagerly Sunday evening as the Globex opens at 6:00 p.m. EST to see if the PPT shenanigans from Friday carry over into the new week. oh never mind) but the karma in my den which has been in total harmonious Nirvana for the month of December has been shattered like an icicle falling from the eaves. I might be a tad paranoid but I am of the belief that the same forces that conspired to screw us in 2013 and which stepped up every time the S&P had more than a 5% dip since 2009 are back “in the room” and whether or not that is why I find myself alone is not important. What IS important is that we hang onto the greater portion of gains in gold, silver and our beloved miners bestowed upon us in Q4/2018. Gold gained 7.53%, silver has gained 15.54%, and the HUI (gold miners) has gained 13.83% in Q4, so I’ll be damned if I am going to give back any of those gains. I will know early in the week and if I see something between now and the opening, I will send out an email flash or a tweet. 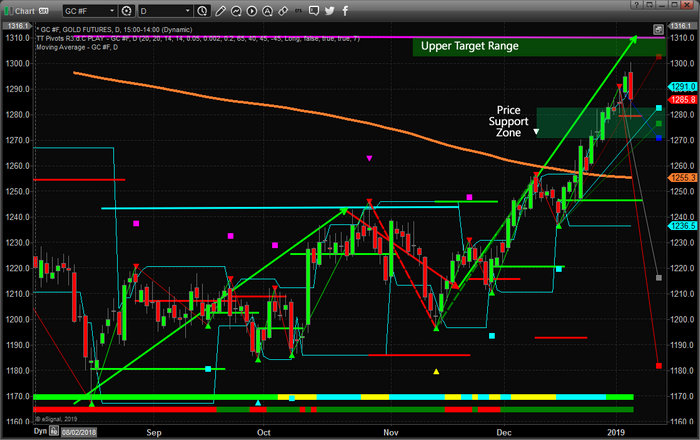 Dr. Copper: Is the good doctor telling us to head for the exits? 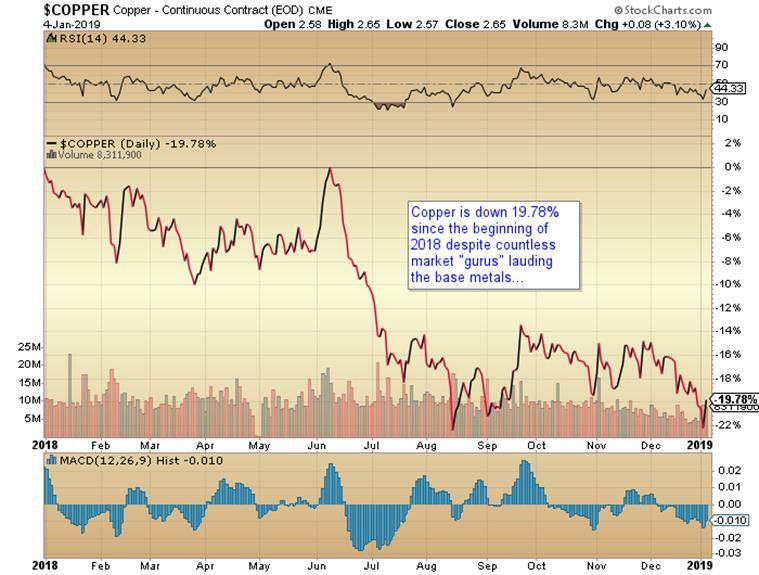 As we head into the first real trading week after the low-volume holidays, it will be critical to observe the behaviors of all of the metals, including Dr. Copper, to try to discern the direction of the portfolio. Copper and silver once were strongly correlated and now have diverged, freeing the algobots from pounding silver every time the base metals have a hiccup. The chart shown here is a strongly bearish one, albeit somewhat oversold based upon the MACD/Histograms yet not so for the RSI. The trend is definitely down and until proven otherwise, copper’s performance appears to be confirming that which we all suspect to be truethat before too long, the Fed, the PBOC, the ECB and the BOJ will all be in simultaneous and cleverly coordinated EASING and when that happens, the USD is going to get smoked. The 10-year U.S. Treasury yield has crashed from just under 3.25% in October to 2.67% today which, in the bond world, is a cataclysmic, several-sigma event. As I have written of before, the bond market is infinitely wiser than the stock market in forecasting events and while the Fed can intervene in gold pricing and at the short end of the curve, it has a very tough time with the 10-year. Ergo, my portfolio will be tilted in favor of a watershed-type of event that sees a cessation in rate hikes and a stay in central bank balance sheet reductions. The eardrum-splitting sirens you will then hear are the emergency alert warnings from all FOREX desks across the globe calling all to EXIT the U.S. dollar for the final time, as its reign as the globe’s reserve currency comes to a resounding end. 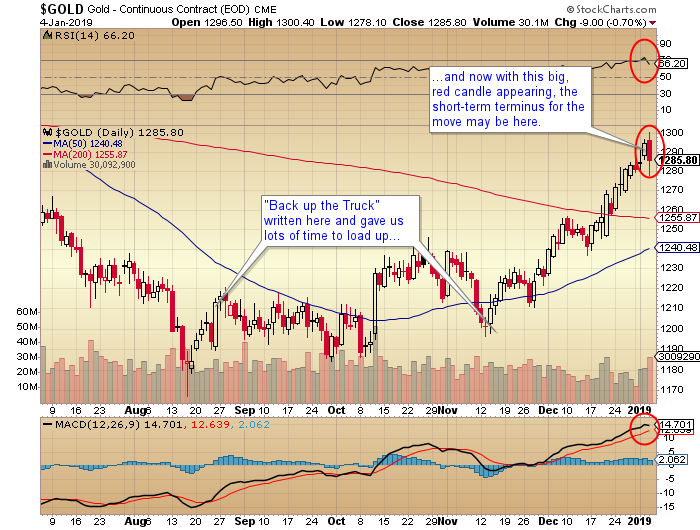 With that, gold and silver prices will soar and our gold miners and explorers will flourish. However, before that happens, remember this: in the animal kingdom, there is nothing more dangerous than a wounded beast. Just as the vast majority of the ecosystem fears man above all as the planet’s premier “apex predator” (no natural enemies left), the only creatures that do NOT fear man are insects, sharks, wolves, Komodo dragons and one otherthe “wounded” creature of all shapes and sizes. Even a cornered, injured raccoon can be a fearsome and lethal threat if trapped and desperate. In this manner, I see the world’s central bankers in exactly the same venuetrapped and wounded and in desperate need of a solution to a “problem,” which they themselves along with their politician cooperatives actually created. That is why I am going to hold on to my physical precious metals as core positions and not available for trading but as call options; they will be the first to go with the miners a close second in the event that we get a gold/silver-hostile series of events next week. If we do, it means that the “invisible hand” has not stopped with the Friday intervention and that they will continue just as they did in 2013 and crush bearish sentiment for stocks and bullish sentiment for gold and in any way they choose. The company provided a breakdown of the year’s production by mine. Leagold Mining Corp. (LMC:TSX.V; LMCNF:OTCQX) announced in a news release it achieved revised 2018 production guidance of 295,000305,000 ounces by producing at total of 302,550 ounces from its quartet of mines. “2018 was a transformative year for Leagold, as we evolved from a single mine operator into a diversified group with four mines in two countries,” CEO Neil Woodyer said in the release. “In Mexico, the Los Filos mine demonstrated significant production growth with 25,404 oz produced in December as gold recovery rates are normalizing and resulting in a new record quarterly production of 58,201 oz since our acquisition of the mine in April 2017,” Woodyer added. Gold production in 2018 from each mine, from most to least, was: Los Filos, 195,362 ounces; Fazenda, 46,668 ounces; Pilar, 31,122 ounces; and RDM, 29,398 ounces. Management forecasts the full year 2018 all-in sustaining cost (AISC) will be around $979 per ounce, the level at which it was at the end of Q3/18. The gold miner will report full 2018 financial and operating results in mid-March. Next week, it will release results of studies concerning a Los Filos mine expansion and subsequently, 2019 gold production and AISC guidance. “Leagold is well positioned to deliver increased production and cash flow in 2019,” Woodyer stated. 2) The following companies mentioned in this article are sponsors of Streetwise Reports: Leagold. Click here for important disclosures about sponsor fees. The analyst also pointed out that Macassa, Kirkland Lake’s other cornerstone asset, could hugely benefit from the planned sinking of the #4 shaft, which can hoist about 4,000 tons per day (4 Ktpd), including waste. The shaft should significantly boost throughput at the mine to nearly 2 Ktpd by 2023 and, ultimately, allow for the nearly doubling of production from the current 220225 Moz per year rate. 3. The economics of disposal wells seem attractive, with an average returned EBITDA of 6065%. Pay attention to the Support Zone on this Daily Gold chart and understand that price rotation is very healthy for the metals markets at this point. A reprieve in this recent Gold rally would allow the start of 2019 to prompt a moderate rally in the US stock market as well as allow a continued capital shift to take place. As capital re-enters the global equities markets, investors will be seeking the best investment opportunities and safest environments for their capital. Our belief is that the US stock market will become the top-tier solution for many of these investments. If you’ve been following our research and comments on the past 90+ days. You’ll already know that we’ve nailed many of these market moves. The SPY, Natural Gas, Oil, Gold, Small Caps and so many more. We’ve been calling for a massive price bottom in the US stock market since well before the November 6th US Elections. 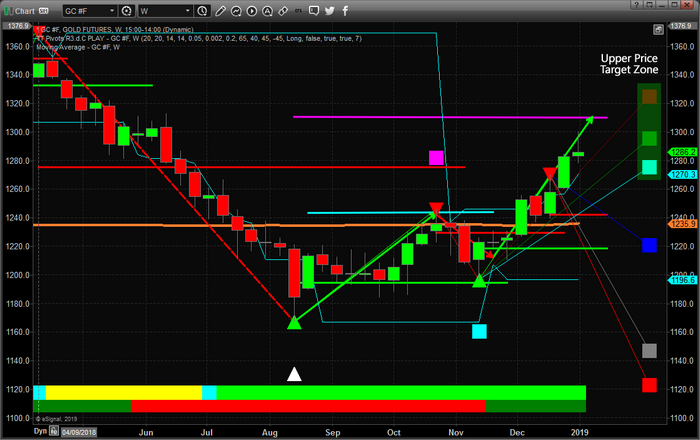 Our proprietary predictive modeling systems called the huge moves in Oil, Natural Gas, Gold/Silver, and many others. If you were not profiting from these moves, then you need to visit www.TheTechnicalTraders.com to learn how we can help you in 2019. Our memberships are very inexpensive and the support we provide you is incredible for skilled traders. Want a team to help you create success in 2019, then visit TheTechnicalTraders.com and get started creating success. CIBC’s current target price and rating compare to its previous US$14.50 target price and Neutral rating on the miner. Barrick’s current share price is about US$13.05. All of the above, along with CEO Mark Bristow’s strict method of evaluating new projects, afford investors in the name the chance to yield a premium multiple, Soni concluded. · CIBC World Markets Inc. expects to receive or intends to seek compensation for investment banking services from Barrick Gold Corporation in the next 3 months.